Hi Everyone, today I’m featuring three cards using the Falling Flowers stamp set. If you like heat embossing, and really who doesn’t love watching the heat melt the embossing powder to create such a glossy, shiny finish, this style of card might be for you. I stamped lots of the images from the stamp set using the whisper white ink on whisper white cardstock. I sprinkled the embossing powder on as I went because it is quite difficult to see white ink on white cardstock. I then heated all the embossing powder and set to colouring the images. I squeezed the ink pads so a bit of ink remained on the lid and used this as my palette. I then painted all the images. Such a soft pretty look, don’t you think? All that remained was to die cut the images out and layer them onto the card panel in an appealing way. Materials used: Stamps – Falling Flowers (139556), Happy Birthday Gorgeous (143662); Dies – May Flowers Framelits Dies, Lots of Labels Dies; Ink – Whisper White, Pink Pirouette, Soft Sky, So Saffron, Wisteria Wonder; Soft Sky, Whisper White. For my second card, all I did was substitute the pool party background for crumb cake. I love this look! 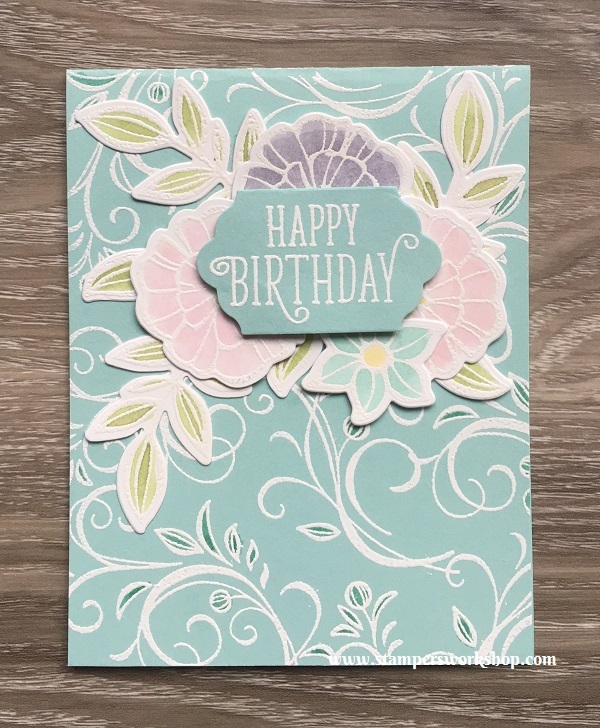 Materials used: Stamps – Falling Flowers (139556), Happy Birthday Gorgeous (143662); Dies – May Flowers Framelits Dies, Lots of Labels Dies; Ink – Whisper White, Pink Pirouette, Soft Sky, So Saffron, Wisteria Wonder, Crumb Cake; Cardstock – Crumb Cake, Whisper White. If you aren’t a fan of so much white embossing, that isn’t a problem! For the next card, I swapped out the white embossing on the base of the card and used versamark ink in its place. It gives a much softer look. 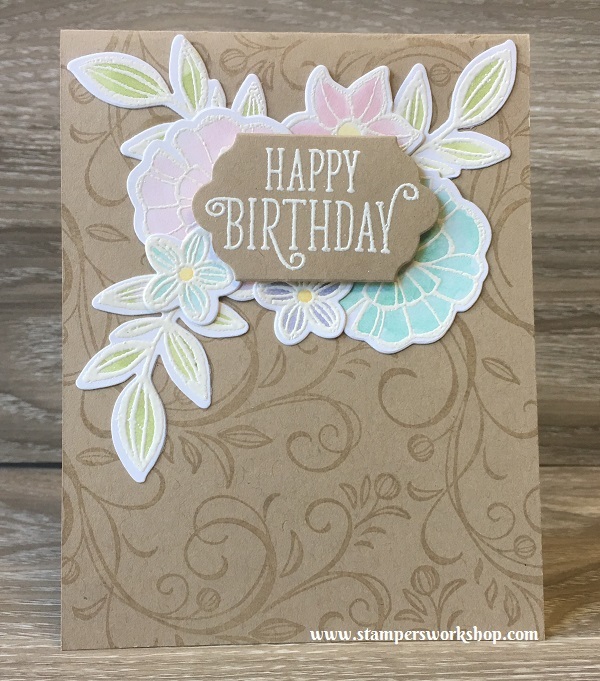 Materials used: Stamps – Falling Flowers (139556), Happy Birthday Gorgeous (143662); Dies – May Flowers Framelits Dies, Lots of Labels Dies; Ink – Whisper White, Pink Pirouette, Soft Sky, So Saffron, Wisteria Wonder, Versamark; Cardstock – Crumb Cake, Whisper White. 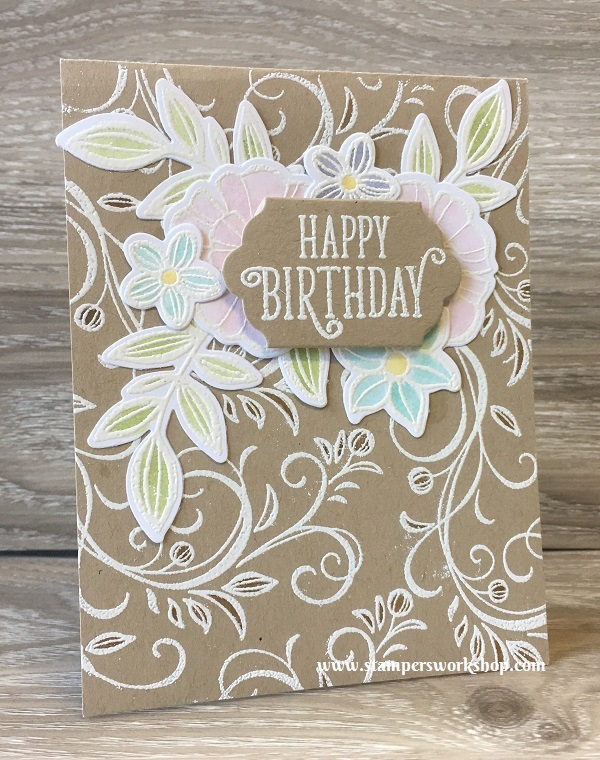 Can you imagine how pretty this card design might be if you used pink pirouette or wisteria wonder as a base? Or perhaps, you could do all the stamping with night of navy or early espresso and create a monochromatic look? Isn’t it so much fun to experiment with colours? Listed below are the supplies used to create the above project. If the stamp set comes in different types (such as clear mount or wood mount), I link to them both. At the end, I have also linked to other ‘staple’ items you might need to finish the project (such as adhesive and a paper trimmer).